Whether you are a person with aphasia or a loved one/friend, communicating when aphasia is in the mix can be effortful, challenging, and frustrating for all parties involved. Read on to learn about 12 helpful tips to better communication. Have you ever experienced a conversation like this? Communication partner: John, would you like some lunch? Communication partner: What would you like? Conversations like these happen between many communication partners and persons with aphasia. Oftentimes, both parties end up feeling frustrated, annoyed, and possibly hurt by exchanges like these. So, what can be done? 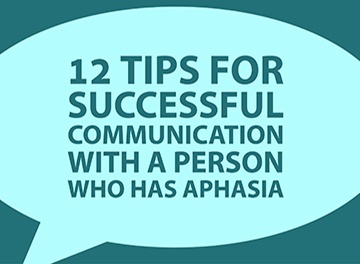 6 tips for helping the person with aphasia communicate their message. For example, one tip to get the person with aphasia to understand your message would be to use short, simple sentences in a normal tone of voice. Speaking loudly isn’t necessary for most people with aphasia, and less complex sentences may be easier for him/her to process and understand. A tip for helping the person with aphasia to communicate his/her message would be to ask “yes or no” questions. This will help you hone in on what your friend or loved one wants to say to you. Remember: as the communication partner, you are the one who can speak. Be patient and supportive when engaging with someone with aphasia. Their speech is a struggle. Click below for your printable 12 tips…and we encourage you to hang them on a bulletin board, refrigerator, or any place where you will see them on a daily basis. Here’s to more effective, supportive communication!